Did you know they call the western Michigan coast the “Riveria of the Midwest”? We had no idea this area was that beautiful. Craig always visualizes Detroit when he thinks of Michigan, but just like New York, these states are so much more than their famous cities. Way up north, Mackinaw Island is surrounded by rocky beaches, but as you head south into Lake Michigan the beaches turn sandy. The water is still a breathtaking mix of aqua, sea green and bright blue, depending on how the sunlight hits it. For us girls, there are only tiny, clam-like shells to collect, including the zebra mussels that have cleaned the lake so thoroughly that it’s see-through 20 feet down. But there are multicolored rocks to sort through, including Petoskey Rocks that bear fossil markings from long ago. The coastline is studded with delightful resort towns, each rightfully claiming a bit of fame, from Hemingway’s haunt in Petoskey to Sleeping Bear sand dunes near Frankfort. Houses on sand dunes. Who needs a stair stepper?! The sunsets were stunning (!) and we were treated to fireworks right off the stern (back) of our boat in Charlevoix during their Venetian festival. There are more lovely towns south of Frankfort, but we’re saving them for another trip as we needed to head across the lake to Wisconsin, Craig’s adopted home state. We’ve met some fantastic people along the way but there are no friends like old friends, so we were thrilled to have my wonderful college buddy Deb, and her husband Dave, aboard Joy Girl in Petoskey. We introduced them to anchoring out in Lake Charlevoix, strolled through gorgeous Harbor Springs, grilled, dined out and were not ready to see them go! Biggest challenge on this leg of the trip: Lake Michigan. Home to approximately 2,000 ship wrecks, this beastie is enormous, unpredictable, and prone to squalls and wicked wind that can produce waves that range from uncomfortable to terrifying. Our days were filled with chart watching to identify the weather window when we could venture out without being tossed in the ocean-like swells and waves. We did make it across her, from Frankfort, Michigan to Sturgeon Bay, Wisconsin in 7 hours without bodily or boat injury! The good news: Michigan is usually the “lee” shore, meaning it typically gets blasted by winds from the west. Wisconsin is the “windward” shore, so it shouldn’t be as rough since the wind rolls over it, headed east. Here’s hoping! Future Plans: We’ll slow down for the month of August and take our time cruising Door County, Wisconsin. 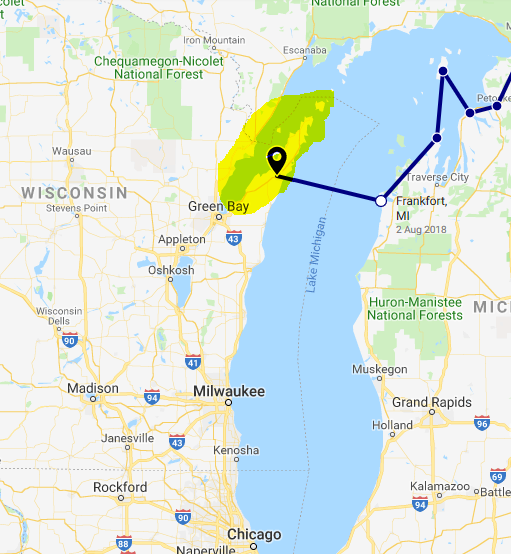 This peninsula is surrounded by Lake Michigan and the waters of Green Bay, and is well known for its quaint resort towns, beautiful sunsets, and thriving arts community including painters, musicians and excellent theater. As theater people, we’re excited to see a few good shows. In early September, we plan to leave Wisconsin with a big bang by attending the Green Bay Packers home opener against the Chicago Bears in Lambeau Field on 9/9. Go Pack Go! As usual fantastic photos and the stories to go with them. Was watching “Where’s Joy Girl” to see when you crossed Lake Michigan. Enjoy late summer in Wisconsin! So good to talk to you the other day, R.J., and so great to hear your encouraging words again! Thanks so much and glad to hear you enjoyed the post! Hi Anne! So glad you enjoyed the photos! Today we are heading up the Door County peninsula from Sturgeon Bay, so we’ll be seeing those cute little towns soon 😀 Be well!